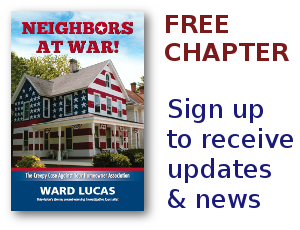 You Can't Go Home Again - Neighbors at War! Often, when I’m writing or researching material to post on this column, I find myself feeling a little down, knowing how many people have lost their homes or their peace-of-mind while trying to do battle with the scandalously corrupt Homeowners Association movement. I get hundreds of emails each day from people who’ve lost their homes or their net worth while trying to battle a movement that operates completely outside the guarantees of the First, Second and Fifth Amendments to the Constitution. Yes, as many of you know it can be a little depressing. Still, I’m not a negative personality. I always look for hope and pray for change. On these long evenings that I set aside for research, I often have music playing in the background to keep my mind on an even keel. Right now, one of my favorites, James Taylor, is playing his song, Copperline. It’s a song about his youth in Chapel Hill, North Carolina. He sings about the row of moonshine stills along Morgan Creek which ran about a half mile from his boyhood home, and the magnificent night he lost his virginity. “Took a fall from a windy height, I only knew how to hold on tight. Chapel Hill, these days, is infested with the ‘new housing model’ which takes all the old neighborhoods and embeds them in the kind of concentrated, regulated housing that makes it impossible for our young to experience the complete innocence of youth. “All spec-house and plywood, tore up and tore up good….” It makes one want to weep for the destruction of the innocence we all wish we could have passed on to our children. Thomas Wolfe, also a North Carolinian, wrote the 1940 novel, You Can’t Go Home Again, five words which are probably as true as any spoken. We can’t go home. Yes, we can return to the geographic spot where, in our youthful exuberance, we created memories and romance that can never be experienced again. But those moments of youthful innocence are gone forever. If the people are afraid of the government, that’s tyranny. If the government is afraid of the people, that’s liberty.